Kent L. Thornburg received his Ph.D. in developmental physiology from Oregon State University and studied cardiovascular physiology as a National Institutes of Health (NIH) postdoctoral fellow at Oregon Health & Science University (OHSU). 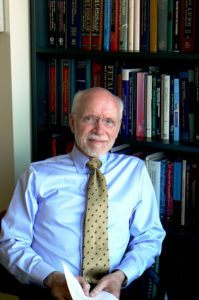 He now holds the M. Lowell Edwards Chair at OHSU as a professor of medicine. He is the director of the OHSU Bob and Charlee Moore Institute for Nutrition & Wellness and the director of the Center for Developmental Health in the OHSU the Knight Cardiovascular Institute. Dr. Thornburg is the principal investigator on NIH-funded studies including maternal-fetal signaling, thyroid hormone, early origins of aging and heart development and placental function. He participates in co-funded projects with scientists in England, New Zealand, France, Finland and Australia, and has authored more than 125 articles on pregnancy and fetal development. I learned that when you first heard Dr. David Barker discuss his findings in developmental programming you initially didn’t agree with him. May you please explain why you initially disagreed with him and what turned your views around? May you explain how the nutrition the mom receives before pregnancy sets her future child’s risk to chronic conditions? Would the nutrition a father receives prior to conception have a similar impact on the DNA he is passing on to his children as well? May you please explain how the diets of our grandparents influence our vulnerability to chronic conditions into adulthood? What changes would you like to see come from the field of developmental programing? What are the current challenges that you face to make the research implemented and actionable within our communities? What do you want community leaders to do with the discoveries in this field? What do you want planning and expecting parents to do with this information? Where can people find more information about you and Better the Future so they can learn more and get involved.